Published May 1, 2015 by Addison-Wesley Professional. Part of the LiveLessons series. “Covering Swift Basics” familiarizes you with the foundational syntax and gets you started writing Swift statements in Xcode and working with the new read-eval-print-loop (REPL). You learn about features common to most languages, including arithmetic expressions, conditional logic, and iteration, and you learn how to use types to store different kinds of data. “Introducing Functions and Closures” covers functions, closures, and how to use functions as first-class objects in Swift. You learn about the structure of functions and closures and how to use them to perform actions and calculations. You also learn how to pass functions and closures to other functions to be executed elsewhere. “Defining Data Structures” takes a look at classes, structs, and enums. 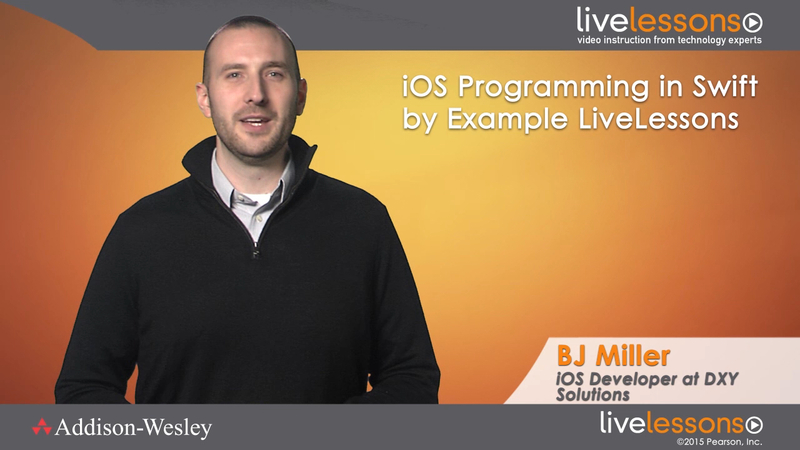 You learn about the differences between how Swift and Objective-C handle these types. You learn how to create classes, structs, and enums; how to add stored and computed properties to these structures; how to use raw values with enums; how to add initializers; and how to use optional values. You also learn about the initialization phases for initializing instances and about the memory management involved with reference types such as classes and functions. “Learning Advanced Swift” explores more complex Swift topics. You learn about optional chaining and how to use optionals to your advantage. You then learn how to use extensions in Swift to extend a type’s capabilities without modifying it. You also learn about generics and other introductory aspects of functional programming. “Using Swift with Objective-C” explains how to integrate the two programming languages within the same project, regardless of whether the project started in Objective-C or Swift. You learn how to bridge data types and recognize the differences in syntax. “Understanding Cocoa Concepts” covers the Model-View-Controller (MVC) paradigm with respect to iOS development. You learn how to design efficient and well-structured object-oriented code. You learn how to use the MVC paradigm to separate code into manageable and sensible chunks. You learn about the Cocoa Touch view lifecycle and about using delegates and data sources to provide custom actions and data to a requesting object. Finally, you learn how to work with, retrieve, and persist model objects to disk using Apple’s Core Data framework. “Defining Interfaces with Storyboards” teaches you how to use Xcode's Interface Builder to create the visual layout for your application. You learn how to use Xcode’s Interface Builder component to build storyboards and how to connect its many different UI elements to code. You also learn how to visually lay out an interface using Auto Layout that accommodates devices of various sizes. Finally, you learn how to customize app flow by using segues to handle navigation. “Creating Apps—Integrating Concurrency and Fetching Network Data” covers the different methods of fetching data from the network. You learn about the differences between synchronous and asynchronous operations, and you learn how to use Apple’s built-in frameworks to assist in creating efficient software. You also learn how to parse JSON. Finally, you learn how to create an entire app using your cumulative knowledge of Swift and Cocoa Touch.